Antifragile, by Nassim Nicholas Taleb . Read this book. I like the book, and the idea, because it feeds my confirmation bias- but I think it is right, anyway. I'll admit, I am still reading it, but I don't see it going astray. One of the major points of the book is that by designing all the danger out of things, trying to make the randomness and volatility go away and keep things smooth and "safe", you make the danger worse. It's inevitable and natural. Completely unavoidable. Just like how anti-gun "laws" actually increase the risks they claim to want to solve. The people who embrace these ideas may have good intentions, but they are idiots. The author seems to be right on point, just as he was in his book The Black Swan (which so many reference, but apparently didn't read very carefully). Taleb has more erroneous faith in the potential goodness, usefulness, and necessity of governments (and some residual anti-gun bigotry) than I ever will, but I can overlook his error in this case. One point I took from the book, which statists won't like, is that those who squawk loudest about loving the USA are dooming that which they love to a violent death. All centralized states are in a constant condition of collapse. It is simply the nature of the thing. You might as well complain about gravity if you don't like this fact. Every centralized state is balanced on a razor's edge. Those trying to hold it together, and not let bits of it fall off one side or the other naturally, are dooming the whole enchilada to be sliced in half by the razor. Let the centralized state fall apart naturally, gently, with as few casualties as possible, rather than this suicidal course statists (nationalists, "Patriots", Constitutionalists, and others) are choosing with this doomed "The Union MUST be preserved" nonsense. Their path is insane. Secession is the only possible way to save America- and it needs to be an ongoing process, continuing to break into smaller and smaller pieces. I suggest taking secession all the way to the level of the individual. All large, meticulously planned, controlled "things" are fragile. They have the illusion of stability at the cost of actual stability maintained by a bit of natural (and necessary) volatility. One tiny stressor can shatter the whole thing most spectacularly when you least expect it. Expect it and make sure you'll benefit when it happens. It's the smart thing to do, since the morons insist on continuing along their foolish path. 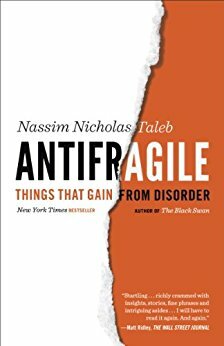 And, following the smart path, read Antifragile.